Treat your special ones by ordering online this Blooming Tempting Moments Red Roses Bunch and Sweets for them and show how special a place they hold in your heart. It is perfect for special occasions. 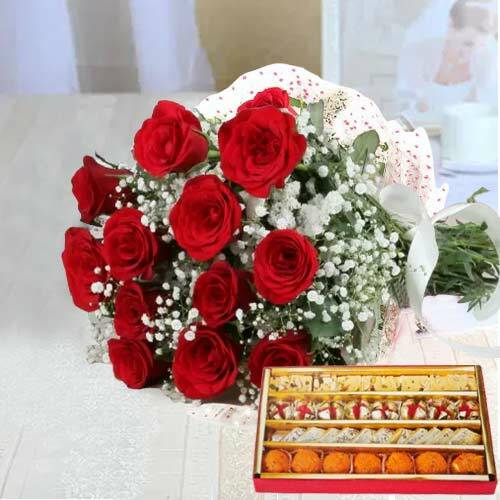 Flowers Delivery Nagpur, Send sweets Bhubaneshwar, Wedding Cake Bhagalpur, Diwali Mithai Howrah, Send Flowers and Gifts to Gorakhpur, Online Shop Mohali, Flower to Ludhiana, New Year Flowers Purnia , Fresh Fruits Firozpur, Send Gift Pondichery, Dry Fruits to Bikaner, Birthday Delivery Quilon, Sending to Madurai, Flower shop Bhopal, Adilabad Online Cake Delivery.